Disaster relief is an increasingly important mission for China’s armed forces, both domestically and abroad. Domestically, China frequently suffers from earthquakes, floods, landslides, and other natural disasters. 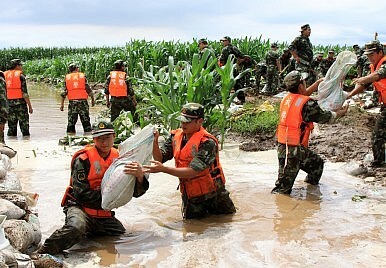 As the 2013 white paper put it, China’s armed forces (including the PLA and the paramilitary People’s Armed Police Force or PAPF) “have always acted as the shock force in emergency rescue and disaster relief.” In the past decade, China has placed more of an emphasis on solidifying the organizational and logistical aspects of disaster relief efforts to ensure a quicker and more robust response. Xinhua noted that the additional focus on HA/DR, including increased drills and spending, paid off with a “more swift and efficient” response to the Yunnan earthquake. China is also slowly moving toward HA/DR missions abroad, where the PLA’s image could sorely use a boost. Indeed, China’s success in convincing others that its growing power is beneficial is crucial to the question of what China can “legitimate its would-be hegemony,” as Robert E. Kelly puts it. So far, to the extent that the PLA has become involved outside of the Asia-Pacific, it has been in nontraditional areas, particularly U.N. peacekeeping missions and counterpiracy efforts. HA/DR remain a small but growing part of the PLA’s activities abroad — according to the 2013 white paper, China has participated in eight international rescue missions since 2001, and 36 humanitarian assistance missions since 2002. That includes PLA responses to the 2010 earthquake in Haiti, the 2011 earthquake and tsunami in Japan, and 2011 floods in both Thailand and Pakistan. HA/DR has been a major focus of U.S.-China military exercises in the past few years, as this provides a benign area of cooperation. Such exercises (including the presence of the hospital ship Peace Ark at this year’s RIMPAC) will also help improve PLA capabilities in the HA/DR. Several U.S.-China joint exercises have focused on coordinating assistance to an imaginary third country, a very real possibility for future HA/DR efforts. As China continues to modernize and streamline its military, it may also seek to increase its participation in HA/DR as a way of improving the PLA’s reputation, particularly in the immediate neighborhood. PLA activities in international HA/DR would show a softer side to China’s military development, and could be used by Beijing as proof that its military buildup is not a threat to the region. Increased PLA participation in regional and international HA/DR would also bolster Beijing’s claims that China is a responsible global power. In the short-term, China’s international deployments, particularly in far-flung regions, are likely to focus on such missions. The U.S. Defense Department’s 2014 report on China’s military predicts that “the PLA’s international engagement will expand, especially in the areas of peacekeeping operations, counterpiracy, humanitarian assistance/disaster relief, and joint exercises.” However, China will be especially interested in demonstrating in HA/DR prowess in its periphery, where PLA capabilities are greatest and the diplomatic benefits are strongest.